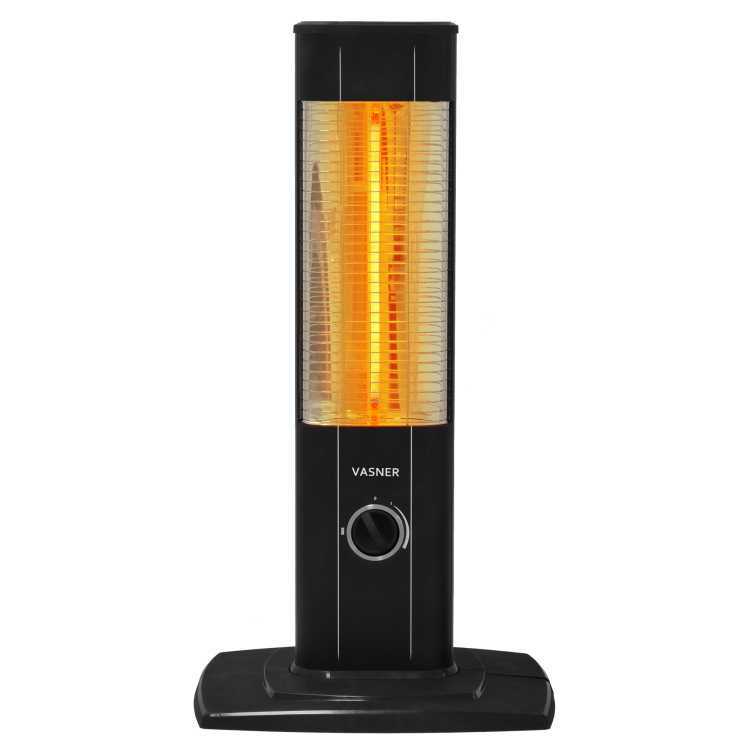 The VASNER StandLine Mini infrared stand up heater proves: Size doesn’t matter when it comes to performance. Therefore, the little brother of the StandLine 25R impresses with its innovative carbon technology and 1.200 watts – for pleasant heat on chilly evenings. Small, subtle and flexible, StandLine Mini electric heaters are perfectly suited for your flat, conservatory, or outdoor areas such as patios. Thanks to its low height, the infrared heater is suited especially well for heating the lower body and leg area under the table – The area that usually gets cold the fastest when seated. Helping you avoid those evening shivers. 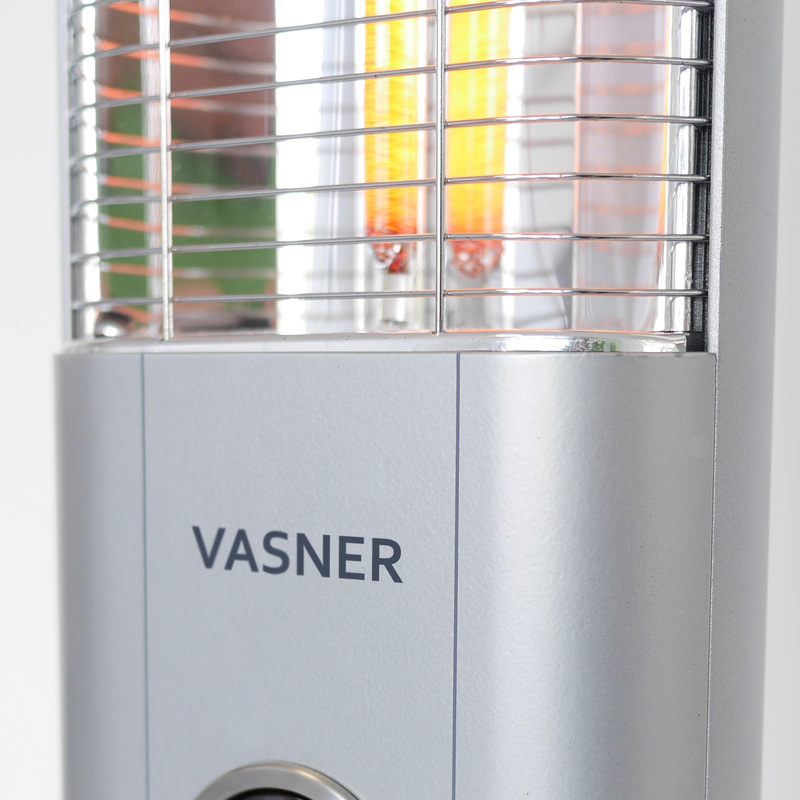 Just like VASNER’s larger model, StandLine 25R, the small stand up heater uses latest carbon infrared technology. High heat energy combined with reduced brightness are just some of the benefits of the innovative carbon tubes. 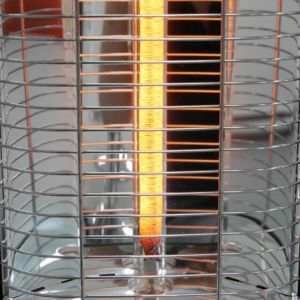 Despite having a shorter heating element, the StandLine Mini infrared patio heater delivers a staggering 1.200 watts. Additionally, the small patio heater’s reflector is specifically designed to distribute heat evenly and maximise the heating range. This has proven to be a beneficial feature when providing warmth to several people at the same time. Just seconds after switching on the StandLine Mini free standing patio heater, it reaches its maximum performance, without a long warm-up period. An additional benefit of the innovative infrared carbon fibres lies in their long lifespan. The long-lived heating elements lend StandLine Mini 12 electric heaters over 10.000 hours of operating time. This is the reason VASNER relies on carbon technology. Electric patio heaters designed for many pleasant moments of cosy warmth. 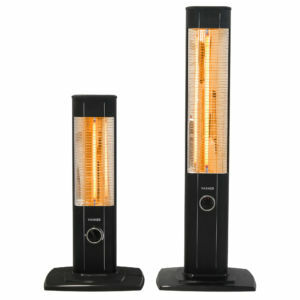 Until recently, the StandLine Mini infrared stand-up heater was only available in the colour black. But as of now, you can purchase the portable heating wonder in the new colours white and silver-grey aswell. Like its big brother “StandLine 25R”, StandLine Mini electric heaters in white feature a premium glossy varnish. This sets them apart as high-quality appliances which can be easily integrated into any bright living space or patio. 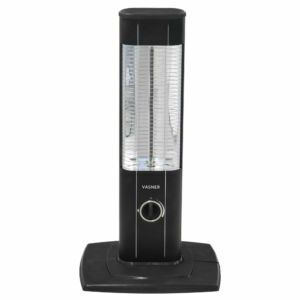 The grey varnish, on the other hand, lends the small electric patio heater a distinctive and stylish appearance. Choose the colour that best suits your decor. Thanks to its vertical alignment, the StandLine Mini 12 is a space-saving heating solution. The small, but powerful stand-up heater fits in any corner and can be accurately aimed at the area you would like to heat. 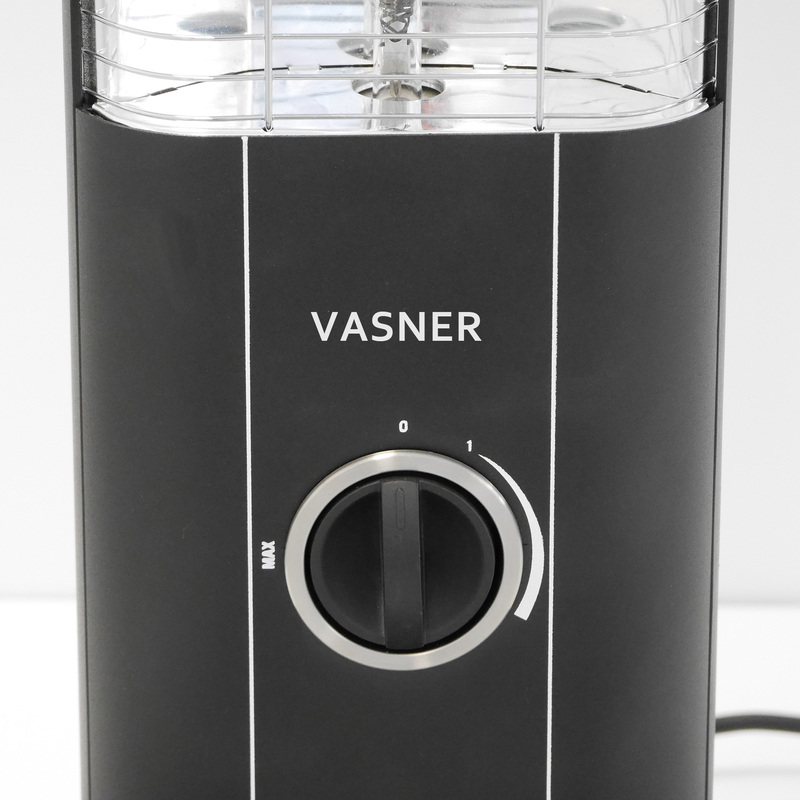 Additionally, VASNER’s free standing heater only requires a common power outlet to function. Simply plug the device into the outlet and the small, but high-powered heater is immediately ready for use. 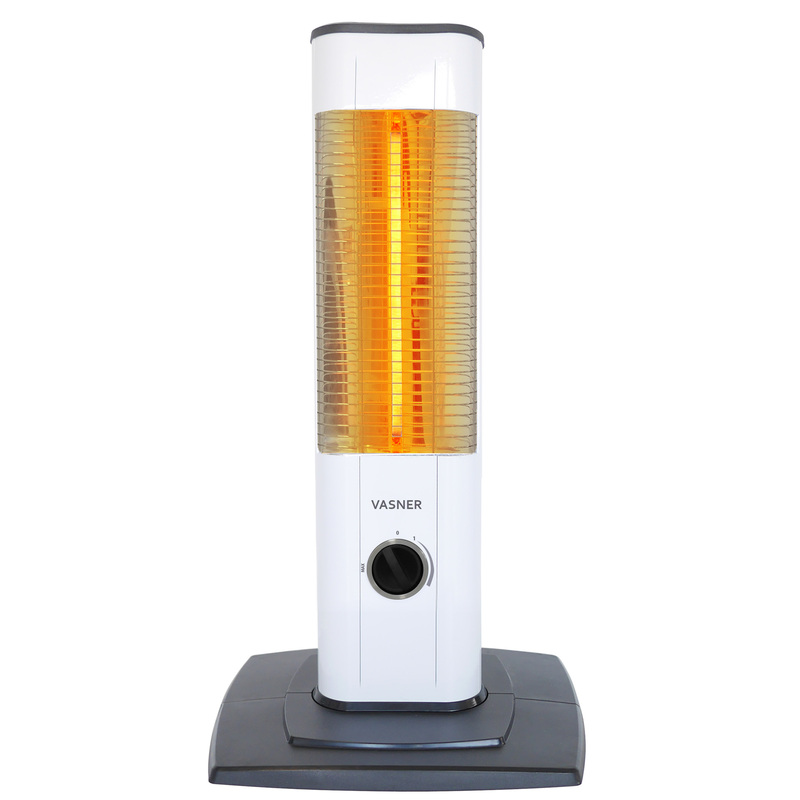 Due to its light weight of only 2,4 kg, the small infrared stand up heater can be moved easily from room to room. Portable electric heaters for a comfortable temperature – outside on the patio or for a relaxing evening on the couch. From one moment to the next, the freestanding heater provides you with pleasant warmth nearly anywhere. Therefore, StandLine Mini units can be used much more flexibly than infrared ceiling and wall mounted heaters that are permanently installed in one place. StandLine Mini 12 – For impressive heating power wherever you need it. 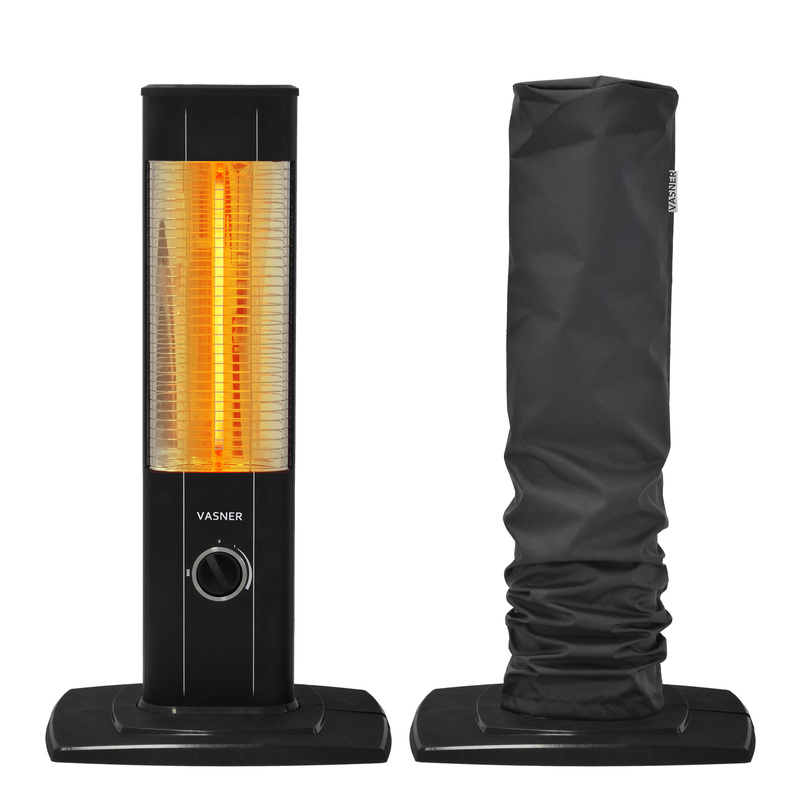 The quick and easy setup of VASNER’s infrared stand up heater is not the only thing that makes it a highly flexible heat source. Thanks to their sleek, premium design, the products heat any room with style. With its compact size, the small infrared patio heater can be incorporated seamlessly into your existing decor. The high-performance device subtly emits a pleasant warmth without taking up a lot of space. Once the free standing electric patio heater has drawn attention to itself with its strong performance, it becomes a true eye-catcher. Its high-quality workmanship and elegant look in black, white or silver reveal that the small electric heater is a true premium product. 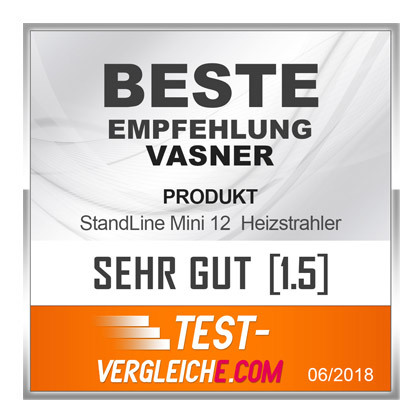 And this is exactly what distinguishes VASNER quality from other manufacturers – Functionality, paired with elegant design. 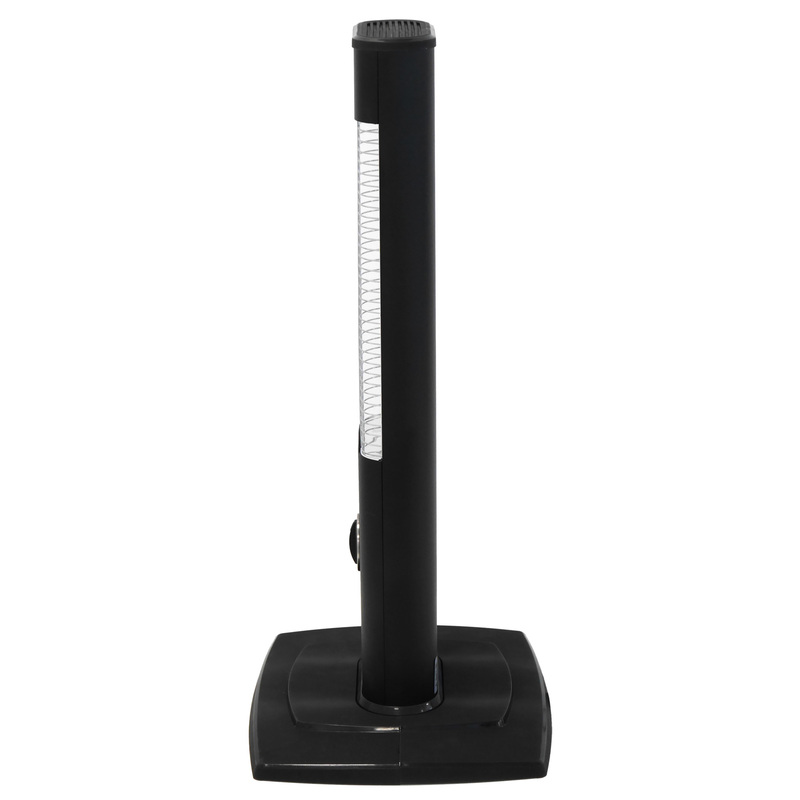 The StandLine Mini 12 infrared stand up heater features an especially sturdy base to make sure that it remains stable in the event of accidental contact. The rectangular foot ensures stability, even in shaky moments. In the unlikely case of the StandLine Mini toppling over, the integrated tilt-protection feature instantly turns the device off – Safety first. Once returned to an upright position, the portable infrared heater can be switched on again immediately using the rotary knob. 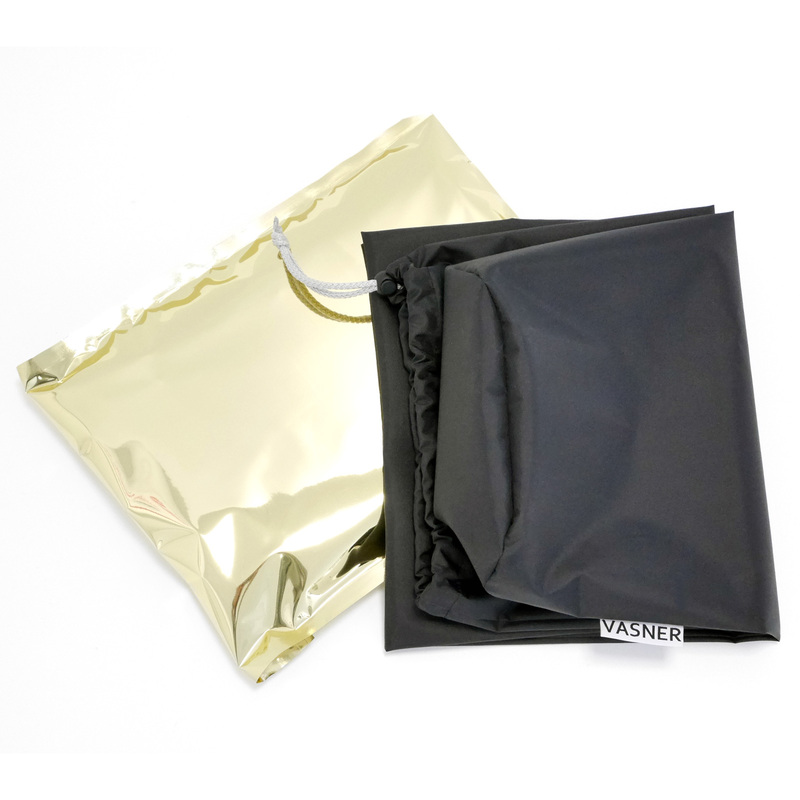 In order for the heating element and surrounding flammable materials to be safe, the carbon tube and reflector are ideally secured against contact with a wire mesh. If, despite all these safety measures, the device should overheat, the StandLine Mini stand-up heater has an integrated overheating protection. The mechanism reacts to high temperatures and automatically switches the device off without any need for intervention on your part. Therefore, you can rest easy and simply enjoy the pleasant and comfortable heat. For additional safety, you can purchase supplementary infrared heater accessories. For instance, the AirCape cover hood protects the StandLine Mini 12 stand up heater from dirt and dust when not in use. You can purchase this article and other infrared patio heater products in the VASNER Online Shop. 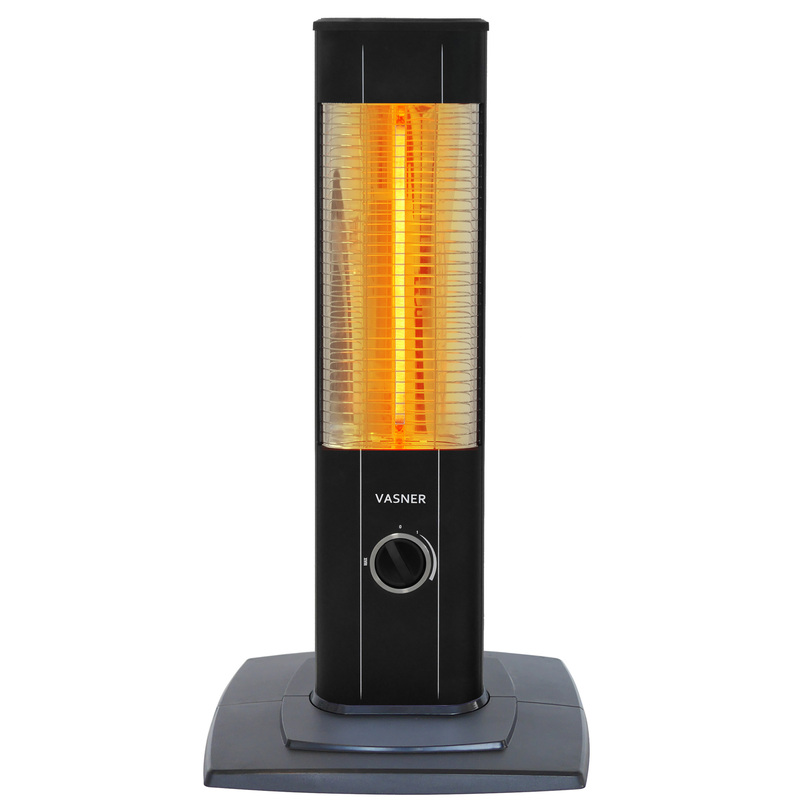 The VASNER StandLine Mini stand up heater has two heat settings you can choose from using the practical rotary knob: 600 watts and 1.200 watts. The true highlight of the portable patio heaters, however, is its integrated thermostat. The mechanical thermostat registers the current ambient temperature and regulates accordingly to reach and maintain your target temperature. StandLine Mini 12 electric heaters can sustain any desired room temperature between 10° und 40° C. You can adjust the target temperature with the simple rotary control. Intuitive and easy. The StandLine Mini 12 infrared stand up heater is ideally suited to heat individuals and rooms as well as maintain a pleasant base temperature and protect against frost. The small, flexible free-standing heater is also suitable for conservatories, patios, hobby basements, for travelling in caravans or camping. Simply good. 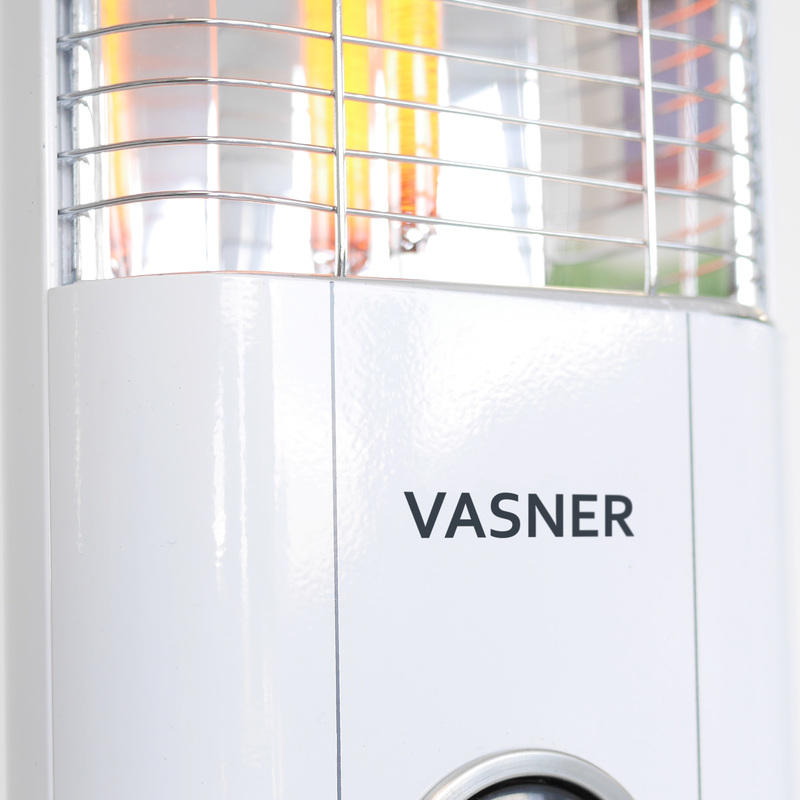 You can order the small infrared freestanding heater in the VASNER online shop for home and garden. 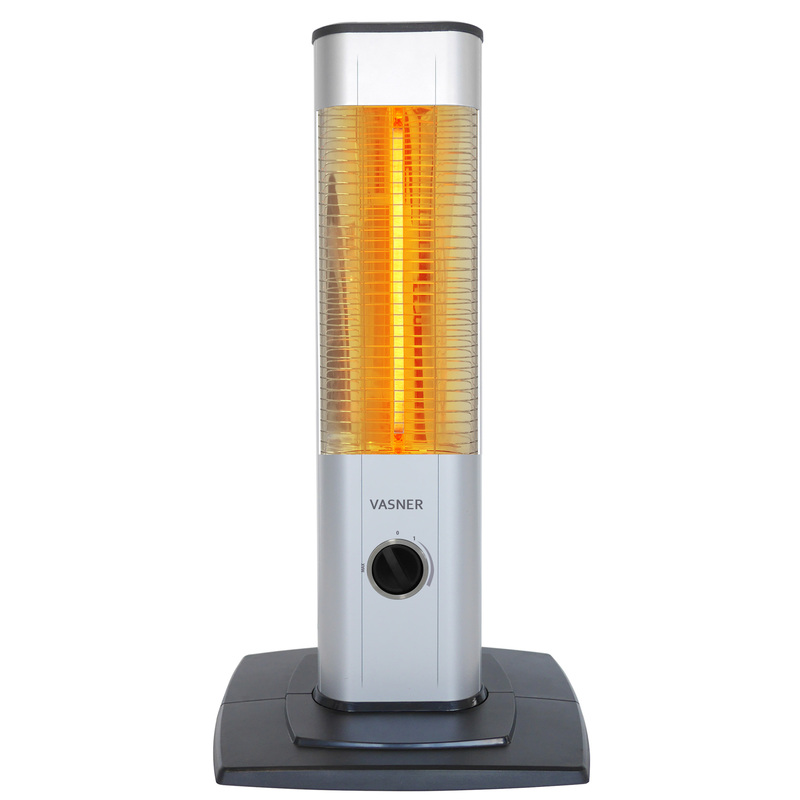 The VASNER StandLine Mini 12 infrared stand up heater – small, simple, versatile, and powerful. The thermostat does not turn the device off completely!